It has been said that "good fences make good neighbors." However, "good fences" are hard to find. It's true that nothing dresses up a home place, farm, or ranch better than an aesthetically pleasing, fully functional fence. It completely changes the entire landscape for the better, and increases the overall property value. On the other hand, nothing looks worse than a broken down or unpainted fence. A rundown fence makes a home place look abandoned and unkept, and is a safety hazard to livestock. Although most all fences look great at first, the big questions are: what it will look like in five or ten years, will it be safe and serviceable, and how much time and money will I have to spend to keep it looking like the day it was installed? For 50 years, Priefert Manufacturing has built a reputation for quality steel products. The innovative and practical design of Priefert Fence is just another example of how Priefert rises to answer the needs of the fencing industry and its customers. Our fences offer you the convenience of no-weld fencing that is easy to install and easy to maintain. All steel components are powder coated to provide a beautiful, durable finish that does not require re-painting down the road. 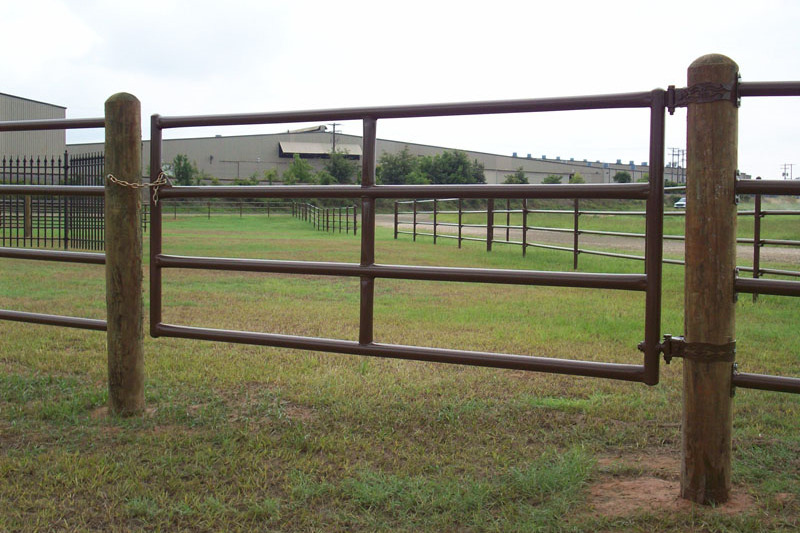 Our line of fencing products are used around the world and even line the ranch of Country Music Legend George Strait. Priefert Fence products begin with the highest quality materials available. These fences not only have the strength to weather the test of time, but also provide an aesthetically pleasing look that enhances any property. Our Architectural Grade Powder Coat provides a lasting barrier against the elements and gives the fence durability and allure that surpasses the competition. We offer more versatility than any of the competition with our Ponderosa Wood Post fence designs. Priefert Fence is the leader in adaptability, functionality, and assembly. While many other types of fences require exact spacing and tedious, precise measuring, our products offer the freedom you need, whatever the requirements. Beginning with galvanized metal, Priefert tubing is passed through a phosphate wash to cleanse the mental of any impurities that may cause the finish to fail. A conversion coating is then applied to the tubing to enhance the adhesion of the powder. Next, the tubing is powder coated using a high quality architectural grade powder with UV inhibitors to help the product resist fading. In the final step of the process, the powder is baked on at a high temperature, which helps the product achieve a durable and attractive finish.